Before we begin our dialogue, let’s watch it shall we? It’s about a baby trashing a bar in the Spanish resort town of Las Palmas–a destination frequented by many British and other European tourists. The writer/producer/director of this short is Swedish filmmaker Johannes Nyquist. There are puppets and a baby involved. Pretty funny, yes? I am a sucker for stuff like this. What shall we label this genre of comedy? I’m thinking that it’s about something real invading the land of the puppet/toy or vice versa–where the puppet or toy enters reality. Examples that spring to mind include the killer cat scene in Team America, the real-world scene in The SpongeBob SquarePants Movie, and perhaps the interviews of Triumph the insult comic on Conan O’Brien. Is there already a name for this sort of thing–the collision of the manufactured with the ‘real’? Does this picture freak you out too? Let this be a lesson to you...don't use Google Image to search for pics of 'real life Sponge Bob'. Thanks for the nightmares, internet. It goes beyond the humanization of objects/animals. It’s more than just anthropomorphizing something. It puts that anthropomorphized thing(s) into a more interesting situation. What can we call it? Puppet relocation program? Figures Action? G.I.Go? These are all terrible suggestions. Please think of something good, dear readers. Anyway, back to today’s winner, “Baby Trashes Bar in Las Palmas”. How come it’s so funny? Without getting too cerebral about it, I think it is so successfully ridiculous because it so wonderfully mirrors real life. Babies, like drunk people, have very little self-awareness and are primarily concerned with their own happiness and pleasure. There’s just something uncanny in the way that kid swirls/smells that wine glass and the overturns it on the table…the way she steals food…the way she falls into the table. In this tow-headed child, we see our own tanked, blitzed, and rat-arsed selves. Well, does it? Should I be ashamed to find this video so wonderful? I don’t think so. I don’t think that what is happening here equates to any sort of abuse. I do think that there ARE times when we should be more protective of our kids and there are times in the entertainment biz when it’s clear that something is exploitative. But, I think there’s a difference between what happens in Toddlers and Tiaras, for instance, and what’s going on here. This isn’t some sad sack Mom dressing her kid up like a prostitute and parading her around just to feel better about herself. This is a genius bit of comedy/commentary about adults. I also don’t think there should be a worry about the child and any unwanted exposure. No one in the world is going to be able to recognize that kid in two years–as they grow they look so different year to year. No, I don’t have kids, but I’ve seen it happen. I barely recognize the photos of my adorable nieces that my sister sends. By the time she’s 3, she’ll have a completely different facial structure. By the time she’s 10, she’s only going to be famous for this video if she WANTS to be…if she identifies herself and takes credit for it. This is also why I don’t think Adam McKay’s done a disservice to his daughter for the Funny or Die ‘Pearl’ videos (“The Landlord” and “Good Cop, Baby Cop”–watch them if you haven’t already!). Who in the world, besides the Family McKay, is going to know what Pearl McKay looks like now that those videos are a few years old? Anyway, I–for one–am eagerly anticipating the release of the FULL “Baby Trashes Bar…” video (this, apparently, is only a portion). Here are some promising stills from the continuing saga! OK, that last pic isn’t from the short. I found it on Google/Tumblr. Pretty rad though, yes? 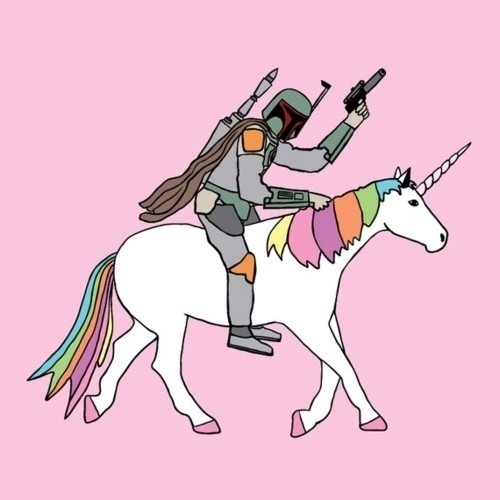 I typed in ‘unicorn awesome’ and this is what turned up. I forgive you for the real life Patrick the Starfish picture now, internet. If you, like me, have too much time on your hands and are excited for the full ‘short’ to debut on the internet, go to the creator’s FaceBook page. That name again is Johannes Nyquist. ‘Like’ the page and you should get updates when it comes out.